Virginia Governor Bob McDonnell Supports Clemyjontri! 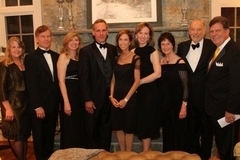 Virginia Governor Bob McDonnell and his wife, First Lady Maureen McDonnell, attend the Friends of Clemyjontri's "2nd Annual Concert in the Park" event on April 21, 2012, at the home of Friend's President & Board Member, Juliann & Dan Clemente. The event raised funds to help purchase and install a permanent tent for the park, providing shade for playground users and an additional location for event use.